Looking for ways to show how special someone made this day? Let them know you treasure the memory by including a picture of all of you, on your wedding day, in a frame that evokes the ambiance of your island wedding. Your family, in-laws, bridal party or guest will know how special they are to you. Our Island Wedding frames are elegantly made with the most durable metal or wood to ensure you or someone special can display that forever moment in full view and keep your wedding close to your heart. 5" x 7"
*Since the products are made with natural material, please acknowledge beforehand that the product may vary in placement of the shells. 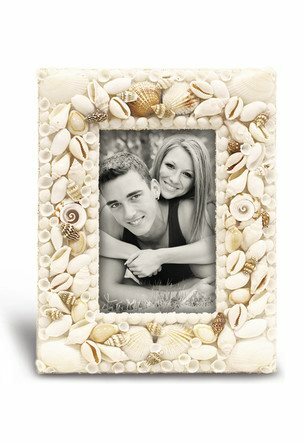 Seashells Capiz Shell Photo Frame 5" x 7"